One of my favorite Christmas traditions is baking and decorating sugar cookies. Every year my mom and I would make the cookie dough, roll it out, and then choose from a myriad of festive Christmas shapes to cut our cookies out with. My favorite were always the snowman and the candy canes! Then I would wait patiently somewhat patiently for them to bake while we prepared the icing. Decorating them with frosting, sprinkles, chocolate chips, candies, etc. was always my favorite part! One year when we were teenagers my brother decided to help my mom and I with the decorating. After a while we noticed that he was not producing as many finished cookies as my mom and I were. I remember looking over as he stuffed a freshly-decorated cookie into his mouth. No wonder his cookies were not making it to the plate :) Suffice it to say our cookie production was slightly less numerous that year! 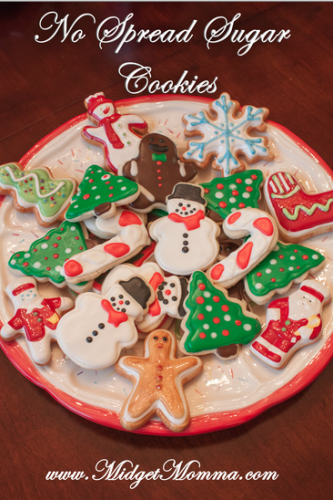 Here is a delicious recipe I found on Pinterest - these cookies are famous for being "no spread" so you won't have the blobby snowman or misshapen angels anymore. Cream sugar and butter until fluffy, about 5 minutes. Add eggs and vanilla. Mix dry ingredients in separate bowl and add to butter mixture, mix well. Put a handful of the freshly made dough between two sheets of parchment paper and roll to desired thickness. Repeat with the rest of the dough. Put the rolled dough including the parchment paper, on a cookie sheet and refrigerate for 10 minutes or longer. Your dough will be chilled and ready to cut and bake. Repeat with scraps after cutting cookies. Bake at 325° F for 10 -15 minutes. Let cool. Combine all ingredients in the bowl of an electric mixer fitted with the paddle attachment. Mix on low speed until smooth and creamy, about 8 to 10 minutes. If icing is too thick, add more water. If too thin, beat icing 2 to 3 minutes more. Add a clear extract to make your frosting take on different flavors. 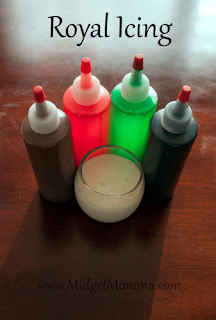 Color icing with desired food colors by blending a drop of coloring into the icing. Gradually blend additional drops until you achieve the desired color. For decorating sugar cookies you will want your icing consistency to be somewhere between heavy cream and ketchup. Not too thick that it won’t come out of your pastry bag or squeeze bottle and not too thin that it rolls over the sides of your cookies.